A few weeks ago, I bought a six-pack of strawberry plants from Target. I transplanted them, watered them and gave them lots of sun. Last week — I finally ate the first fruit! And, they were fantastic. They were concentrated, ridiculously sweet… almost like strawberry candy. Pictures to come, my camera needs batteries. Perhaps I’m getting carried away with this whole reuse-recycle idea… But in another attempt to grow things in containers, I’ve strung up an empty yogurt container and now have a marigold seedling growing out of the bottom. I took the picture right after the planting (yesterday). When I checked on it today, the seedling is starting to grow sideways. I’ve seen upside down tomato and strawberry planters for sale… But those both seem like heavy plants that my yogurt container, kitchen twine and bike handle (what its hanging off) might not handle so well. What plants do well upside down? Is an herb garden hanging over my kitchen sink a plausible idea? I made* frozen yogurt! It was tasty! 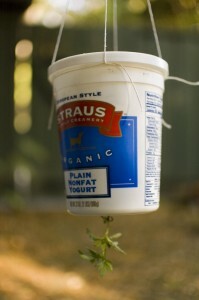 2 cups yogurt (European Strauss Family Creamery, low fat) + 1/4c sugar. Mix together, toss into ice cream maker (Kitchenaid stand mixer attachment in my case) and let it do it’s thing for 15 minutes. Eat with cacao nibs and sliced fruit. I like my yogurt tart, so I didn’t add much sugar. I’m sure this varies from person to person, but I suspect most people would like more sugar than I included. Next up is trying out different kinds of yogurt. Most of the recipes I’ve seen have involved Greek yogurt. I just used what I happened to have in the fridge. *More like I froze the yogurt. I haven’t been courageous enough to make my own yogurt from scratch yet. You are currently browsing the the hungry moosaurus blog archives for June, 2010.